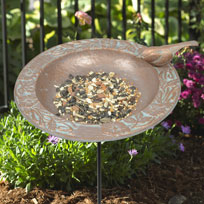 We carry metal and handmade rustic wood bird feeders for the pleasure of your feathered friends! The metal bird feeders are ideal for placing in your garden, mulch bed or, in the ground under your window for some easy birdwatching. Each garden birdfeeder includes a 17" stake so you can plant it securely in the ground. They are made of rust-free aluminum and will last for years. Our wood bird feeders are individually made by our Amish craftsmen. They make a wonderful rustic �I�m in the country, relaxed and well� statement. Each is unique. The creative designs are sure to be conversation starters. Click on the pictures below to see the styles available.